Marmot Jasper Midweight Flannel LS. 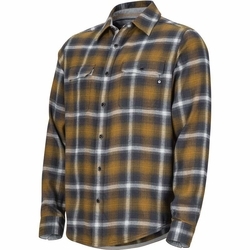 The Men's Jasper Midweight Long-Sleeve Flannel Shirt features moisture-wicking and quick-drying COOLMAX EcoMade technology so you stay dry, warm, and comfortable. UPF 50-rated fabric blocks the sun's harmful ultraviolet rays. Made from recycled Marmot Upcycle Product, this shirt reduces environmental impact, meeting Bluesign environmental standards.